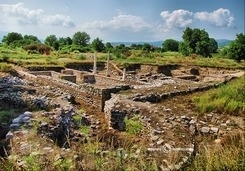 An antique festival will attract tourists at Nicopolis ad Nestum and Garmen municipality as a tourist destination. This project will advertise Garmen as a travel destination. The close proximity to Ognynanovo spa resort, the Thracian sanctuary in Dolno Dryanovo, Kovachevitsa and Leshten, the site will be transformed into a modern tourism destination with various attractions. The project plans the contraction of an attractive illumination, alley network, parking, benches and additional attractions.